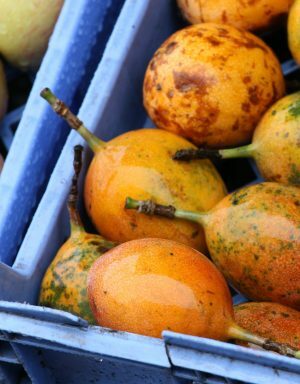 How do international food policies shape our food system at home and abroad? Food activist Raj Patel describes how organizing for local change can help improve the health of communities around the world. 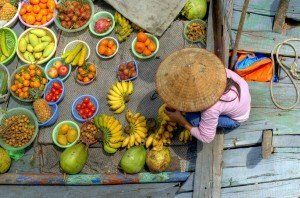 What is “food sovereignty”? How does it relate to “food security”? Raj Patel: What does it mean to be free from hunger? Food security is the idea that governments use to talk about citizens not being hungry, and it means that you have access to enough food to live healthily. Sounds like a good definition, except for when you realize that it’s possible to be food secure, say, in prison. You’ve got access, after all, so you’re not going hungry. But food security never talks about power in the food system—just your access to food. Food sovereignty is like food security, except that under food sovereignty, communities actually get to shape their own food policy and shape the terms under which everyone gets to eat. What’s the connection between food sovereignty and democracy? Raj Patel: If we’re genuinely to have power over our food system we need to be able to decide the rules of the game, deliberatively and with respect for everyone’s rights. That’s what democracy means. Unfortunately, most of us are still waiting for real democracy and, instead, we’ve been fobbed off with its poor cousin—consumer choice. How do US food policies affect farmers around the world? Raj Patel: Very little in our modern diets comes from the places where we eat. Most food carries with it a long and global history—the soy oil in your processed food (and most vegetable oil is soy-based) comes from Asia, tomatoes from the Americas, chickens from India, and so on. That history is very much alive today. Our modern diets depend on an entire system of exchange to get our daily bread onto our plates. It means that our demands shape the way land is used around the world, which prevents citizens in those countries making decisions about their shared resources. Worse, our food system demands are also making us the playthings of food corporations, who make record profits at the same time as rates of diabetes and obesity soar. Increasingly, if you’re a large-scale farmer with access to resources, globalization has been bountiful—markets have opened up so that you can grow crops not only for human consumption, but also for industrial animal feed and even for fuel. But for many smaller-scale farmers, a world of reduced government support and increased corporate control has been far from a blessing. How can individuals and communities organize to create a more democratic global food system? 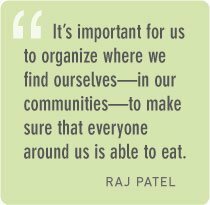 Raj Patel: It’s important for us to organize where we find ourselves—in our communities—to make sure that everyone around us is able to eat, and to have a voice in how they eat. Food policy councils are an idea sweeping North America. There are around 200 in the United States at the moment, and more planned. They bring together local farmers, workers, educators, activists, parents, government, and business representatives to end hunger in local communities. But it’s important for our local food movements not to be parochial. Our governments still do a great deal of harm in the Global South. The Farm Bill is something that we need to organize around not just for its impact on local hunger, but for the harm it causes to poor communities around the world. Moving beyond that, we need to forgive Third World debt and make amends for the damage we’ve caused, to allow people in the Global South a chance to make their own decisions. And we can shift positively toward making our schools and governments buy local, sustainably food grown by workers treated with dignity. Raj Patel: It’s a spark of hope. There are more people—particularly young people—organizing around food justice than ever before. Their grand vision is backed up by action. I’m inspired to be part of a movement that’s fighting not just to end hunger, but to kick-start democracy. Raj Patel is an award-winning writer, activist, and academic. He has testified about the causes of the global food crisis to the US House Financial Services Committee and is an Advisor to the United Nations Special Rapporteur on the Right to Food. He is currently a Food First Fellow and an IATP Food and Community Fellow, and the author of Stuffed and Starved: The Hidden Battle for the World Food System. He regularly writes for The Guardian, and has contributed to the LA Times, NYTimes.com, and other publications. Visit www.rajpatel.org.